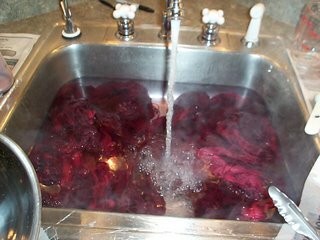 I do wool dyeing in my kitchen which means I have to clear out anything edible. I cover my counters with plastic wrap then newspaper. 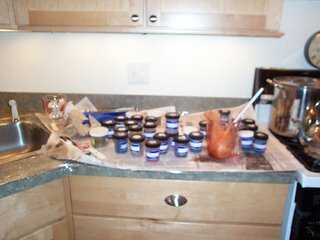 It is important, and I can’t emphasize this enough, to have dedicated pots, pans and utensils for dyeing. 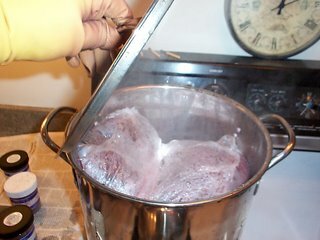 Dyes are quite toxic and you never want to use dyepots for food! With wool and any other protein fibers, you use acidity and heat. 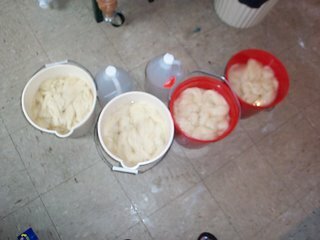 Here is the yarn soaking in water and vinegar. 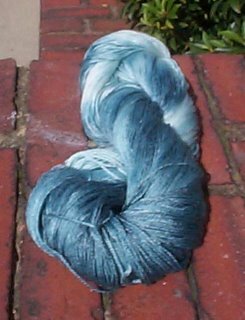 I also use this stuff called synthropol to help the yarn take the dye better. After that, I apply the dye. I do a bunch of different techniques (none of which I managed to take a picture of, sorry about that) but they all end up with the yarn wrapped in plastic wrap and then steamed. and take it out to the back fence to dry. 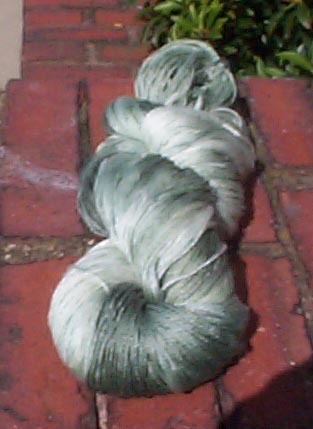 You may think the skeins stay all nice and neat during the dye process but a lot of them end up looking like this. I have my tricks for fixing them but there is generally some foul language involved. 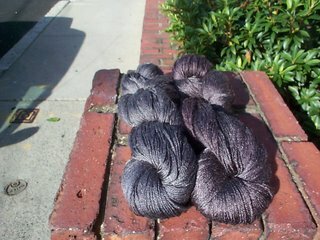 I had a lot of fun dyeing yarn yesterday. I did a bunch of my favorite colors and experimented with several more. Subway Knitter suggested several colors to me and I actually was able to do a couple of them. Both gunmetal gray and raisin came out really well. The picture doesn’t really do them justice. I came to the conclusion that I really needed to buy a dye that specifically says “sage” because I’m obviously unable to mix it. Look for all the yarn to get posted on Etsy in the next few days. Remember, if you order after June 29, you'll have to wait for me to get back from vacation to mail it to you. Very cool to see your process!!!! I am the #1 fan of sage, for sure, but must say, the colors not-sage are very very nice as well. Looking forward to a true sage in the future. I was a bit confused about sock yarn and wool. 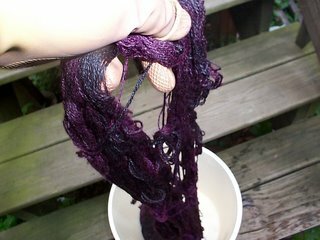 Is sock yarn wool? Obviously, I have never tinked on socks, but hope to when I’m older and better at knitting. As I see it, both are inevasible. I love all of the "sages" so much though. (That may be my great love of all things green and blue speaking though.) Also the gunmetal looks fabulous. I may have to stop in to check it out, especially if you like it better than the picture shows. 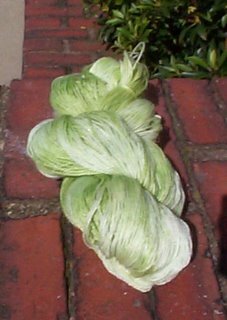 On the subject of not mixing food and dyeing stuff, I picked up a steamer (like a rice/vegetable steamer) at Goodwill yesterday for exclusive dye steam setting use. I was always worried about the saran wrap melting when using a metal pot. Do you find this to be a problem? When one wraps sock yarn in plastic wrap, do the carcinogens leak into your feet? Nayad, I the plastic wrap tends to melt a bit to itself but never onto the yarn or the pot. Great find at the Goodwill. A lot of people I know swear by crockpots for dyeing. Danielle, I'm pretty sure that the sock yarn is fine by the time I'm done rinsing it. Beth S. and Nayad, I'll be listing the Sort-of-Sages on Etsy later today. I was just being snarky! Silly Danielle! You had me worried there for a minute! !